Bunches of hand harvested GRU wheat accessions. SeedStor is a project undertaken by the Germplasm Resources Unit at the John Innes Centre, UK. 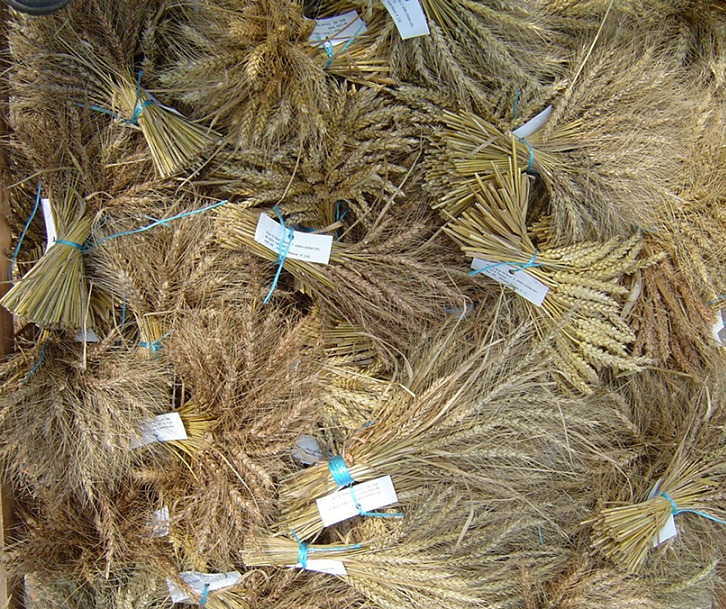 The project aims were to enable a greater access to the data and seed resources held by the SeedBank to Scientists, Breeders and the General Public. To this aim SeedStor greatly expands the information available about accessions compared to our previous online resources and enables users to use a wide range methods to search within the collections. In addition, the LIMS aspect of SeedStor for GRU staff should enable quicker processing of requests and a firmer framework to ensure all necessary steps for a job request from a specific country are completed. Who's Who in the GRU team? Following Mike Ambrose's Retirement Dr Noam Chayut now leads the GRU Team and oversees the unit. Miss Liz Sayers has taken over as the primary contact for the Pisum and Small grain cereal collections. Liz also handles the yearly regeneration of seed stocks. Mr Simon Orford is the lead contact for the Wheat Precise Genetic Stocks Collection and a number of new collections that will be added based on a selection of derived materials. Miss Saleha Bakht works as the lead for the TILLING platform, with RevGenUK now integrated into the GRU we can provide additional services taking advantage of this Technology. Dr Richard Horler developed the SeedStor database and now continues to support this system and the GRU from his role within the central NBIP Computing Infrastructure for Science group. Who's Who in the SeedStor team? The SeedStor website and LIMS has been created by Dr Richard Horler. Project management has involved the GRU team (Mike and Adrian), JIC Scientific Computing (Dr Matthew Hartley) and the Computing infrastructure for Science (CiS) team from the NBIP led by Mr Paul Fretter. Addition of Accession information for a number of smaller collections held by the GRU. Further development of the Public Website to increase the number of tools available, suggestions always welcome. Introduction of User Accounts to enable clients to monitor the progress of their requests. Ongoing collaborative discussions with other Seed banks.